your Mac or PC to full HDMI® output. 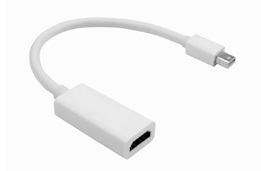 Modern Apple® MacBook's and MacBook Pro's use a new, compact video output called Mini DisplayPort®, meaning they will not connect to your existing HDMI monitor, TV or projector. The same is for many Windows™ graphic cards which also feature this compact Mini DisplayPort™ interface, by-passing the current HDMI standard we used in the past. The new LMS Data C-MDP-HDMI solves this issue and allows instant connection of your existing HDMI video device to be connected to any Mini DisplayPort®, quickly and of course without the need for any drivers or software to be installed. Ideal for Mac® OS X, Windows 7™ or Windows 8™ as well as other leading operating systems, as the C-MDPHDMI works at the system level, meaning it's configured instantly. Supporting up to 1920x1200 resolutions and of course full HDTV resolutions up to 1080p and allowing audio pass-through if supported by the video source*, the C-MDP-HDMI is ideal for digital entertainment from your computer to the big screen, business presentations, learning institutions and anyone else needing a compact, yet stylish HDMI adapter for the current MiniDisplay Port™ equipped computer.